Osteoarthritis is a degenerative joint disease that occurs due to injury or wearing of cartilage especially in the middle or older age-group. Though it can occur in any joint in the body, it is common in the weight-bearing joints, such as the hip. 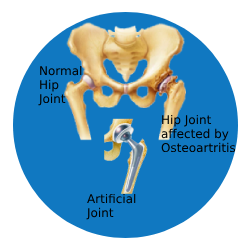 Osteoarthritis of the hip causes pain and stiffness of the joint making daily activities uncomfortable. As it worsens over time, it is preferred to get it treated at the earliest, as that may reduce the impact on your life. Though osteoarthritis cannot be cured, early treatment helps you manage pain and stay active.